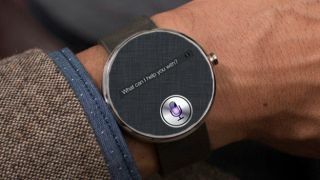 The Moto 360 will bring the first circular screen to wearables, but it looks like Apple may be looking to 1-up Motorola with a curved touchscreen. Patently Apple uncovered a new document that suggests Apple may introduce a curved, touch-responsive display on its rumored iWatch. Unlike curved screen TVs and LG G Flex-type phones we've seen so far, this curved screen wouldn't fan out in a concave shape on a user's person. Rather the screen would be convex and bulge from the center, turning it into a small dome or protruding square sitting above the wearer's wrist. Much of the patent explains how Apple would glue together multiple curved layers to form the screen. Otherwise the document doesn't explain any advantage of having a watch face that bulges, nor does it make any mention of using sapphire. The patent also describes the curved display could be used for a future smartphone, but it doesn't say the technology would be exclusive to handsets, leaving the door open for use in other types of devices. Despite mounting anticipation for the iWatch, this isn't the first time we've heard of a curved touch surface from Apple. Years ago the Cupertino company introduced the Magic Mouse, though of course now we're talking curved touch-enabled screens and not plastic peripherals. Curved display or not, rumors have strongly suggested we could see an iWatch announcement next month at Apple's annual iPhone event. Signs are pointing to Apple utilizing a tough-as-nails sapphire screen with its first wearable as well as a more expensive model of the iPhone 6. On top of this, the iWatch has been said to carry a complete suite of 10 sensors, including an accelerometer and gyroscope, plus some new bits like a pulse oximeter. If the rumors are true, the iWatch would blow activity trackers like the Nike FuelBand SE and Jawbone Up24 out of the water. The iWatch should also provide the same notifications and smartphone experience we've come to expect from devices like the Pebble Steel and Samsung Gear Live.